Hope's Cafe: Organix Hair Care-Review & Giveaway! Organix offers a great line of hair care products that are all Paraben and Sulfate free, contain active organic ingredients, and are safe for color-treated or highlighted hair. They have a nice selection of different products for different hair types-if you have dry hair, they recommend the Coconut Milk or Hydrating Teatree Mint line. Or, if you have lifeless hair, check out the Reviving White Tea Grapeseed collection. If you're looking for a smooth, silky finish, Organix offers the Soft and Silky Vanilla Silk collection. Whatever your hair problem, or if you just need a basic daily shampoo and conditioner, Organix has something for you! Some of the collections are only shampoo and conditioner, but many of them also include other treatments and styling aids. For example, in the Coconut Milk line, in addition to the shampoo and conditioner, you also purchase a Split-Ends Mender, Anti-Breakage Serum, Self-Heating Coconut Oil, Styling Mousse, Instant Repair Treatment, and more! Organix sent me my choice of shampoo and conditioner for review. I picked the Mocha Espresso set (I mean, for a coffee lover, a shampoo that smells like espresso-lovely!). No, honestly I picked the Mocha Espresso because it has sheer silk proteins that add shine to your hair. But, the scent is a definite plus! It really does have a hint of espresso! I used it on my hair for a couple weeks, and I can notice a definite difference in the shine. It also has made my hair softer and smoother...more easy to manage. The shampoo lathers up really well, and it only takes a small amount to cleanse my hair. I love shampoos like that, because many times, since I have long hair, it takes a pretty good-sized amount to thoroughly wash my hair. The conditioner is also excellent. This is the product that helps with the soft and smooth aspect. After applying the conditioner I run a comb through my hair, rinse it out, and my hair is so much easier to comb out after drying! I love the Organix line, and will be purchasing this again in the future! Organix products are not sold directly through the Organix website, but are available online at websites such as Walgreens.com, Amazon.com, CVS.com, cosmeticsolutions.com, and more. Or, you can find them at your local Wal-Mart, Walgreens, CVS, etc. 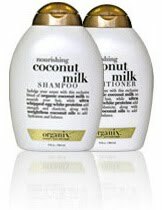 Organix is giving a Coconut Milk Shampoo and Conditioner duo to one of my readers!! Go to Organix and tell me which collection you'd like to try! (They are listed on the bar along the top part of the page). This giveaway ends Tuesday, July 27, 2010 at 11:59 p.m. Please leave a valid email address in each comment, as this is how the winner will be notified. Winner will have 48 hours to respond, or another winner will be chosen. Giveaway open to US residents only. Disclaimer:I received product for the purpose of review. All thoughts and opinions are mine. All quotes taken from the Organix website. I'd love to try the Pomegranate Green Tea line...I've heard really good things about Organix; I'd love to try any of them, really. I follow this blog via google friends! I entered your Tazzini giveaway!! I would love to try the Fortifying Lavender Soymilk Shampoo & Conditioner! Thank you for sharing this cool giveaway with us! The Teatree Mint sounds lovely. I'd like to try the Vanilla Silk. I'd like to try the Moisturizing Grapefruit Mango Butter Collection for my hair. (1) Publicly follow with Google Friend Connect. (2) Publicly follow with Google Friend Connect. I'd like the Coconut Milk collection! Entered the Pink Princess giveaway! I would like to try the Lavender Soymilk. I would love to try the Cherry Blossom Ginseng collection! I would like to try the Cocoa Butter as well.